Ascending the cradle of leadership clearly calls for ingenuity and cautiousness in the service to humanity. Historical book dealing with salient concerns on Genuine Leadership and Followership written by Thompson Finley of the United States of America states and I quote: "Good leaders aspire for leadership just because of the love they have for their neighbours". It is not surprising therefore, that many countries of the world where development anchors, style of leadership take cognitive record of the citizens' needs. Nigeria indisputably, remains a state where the survival of the fittest is the norm. No matter what it takes to rise to the pinnacle of recognition and relevance, people are exclusively mindless. In his commentary, a renowned freedom crusader, Mr. Lonnie Powell once said and I quote: "Your leaders determine whom you are in capacity and in what life gives". Are those who say they are the people's leaders today especially in this part of the world realistically real or just a fictitious bunch of beings? Retired General Yakubu Gowon, after the 1967-1970 war, released a statement which says: "If I had known that Igbo leaders expended money in buying guns, I would have assigned this money to their leaders and allowed them to kill themselves". In the evil plots of the Nigerian Jihadists to Islamise the Igbos amongst other Biafrans, it was revealed that they actually budgeted billions of United States dollars for the so-called leaders of Igbo Biafran particularly, just to help facilitate the securing of their crass frivolous interests. During the Operation Python Dance II that was gruesomely carried out in the upland region of Biafraland (So-called South-East), innumerable number of young Biafrans were killed, others were either maimed or incarcerated, and not a single leader was courageous enough to pointedly condemn such extra-judicially inspired mayhem brazenly committed against unarmed, harmless family members of the Indigenous People of Biafra (IPOB). But they were quick to shamelessly chart the course for proscription placed on Biafrans as terrorists. Conversely and very disappointedly too, no Northern Arewa leader has made a public pronouncement condemning the vampiric activities of Boko Haram terrorists or the Fulani killer herdsmen. They have never openly criticize or condemn the Kaduna declaration of the Arewa youths nor plotted the decimation of their children (the Arewa youths). These Islamic Jihadists sinisterly hide under the cloak of Hausa-Fulani oligarchy to cement and shield their evil agenda through the shameless connivance of the so-called Igbo leaders. These thrive in their wits to perpetuate plans of urinating on the tombs of the young Biafrans murderously killed by the buharised army of Nigeria. The time to frontally resist this wave of evil machinations of the sabotaging leadership in the entire Biafraland has dawned. When the voice of one man goes the direction of the people and irresistibly attracts the emergence of a determined nation, know you that the lions will certainly roar in search of their preys. These notorious leaders have made various locations their abode in their consistent drive to perpetuate wickedness. The worst that can ever happen to a man therefore is to refuse to attract honor from his place of nativity. 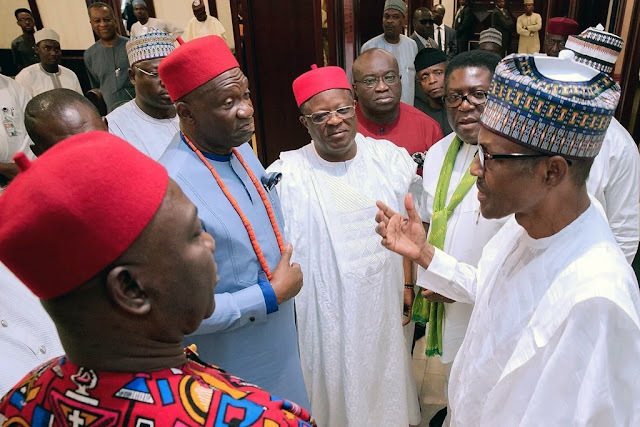 The likes of Nnia Nwodo and associates planning for anti-people's (Anti-Biafran) summit in Biafraland called restructuring of Nigeria, in their evil agenda to service the interests of their Fulani slavemasters, are only fast tracking their recompense. Their avowed plots to dare the warnings of the leadership of the IPOB global family by hosting the evil Summit on restructuring at Awka, come Monday 21st of May 2018, is only a recipe for the venomous visitation of the IPOB. The earlier they rescind that decision, the better for them. Biafrans have repeatedly made it clear that nothing will suffice than a referendum that will afford them the opportunity to decide their own future and it is not negotiable. There is absolutely no alternative to this and the floated agenda of restructuring Nigeria by Nnia Nwodo and his group is already a project that is dead on arrival.